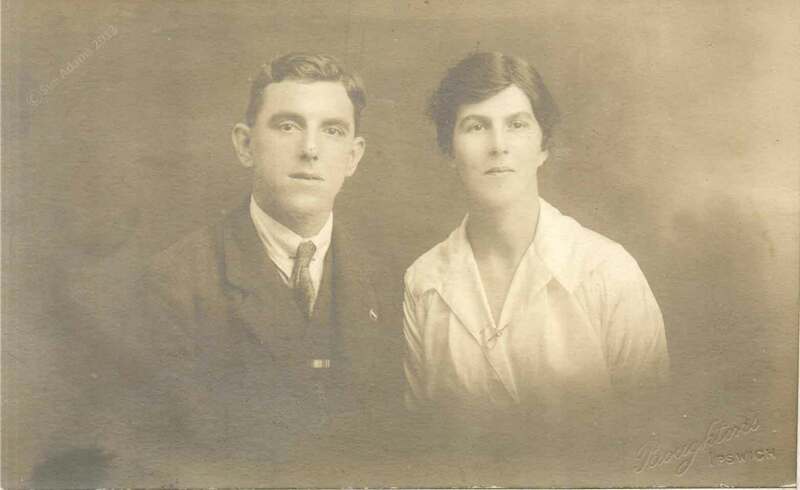 This couple was identified during the settlement of the estate of Raymond Walter Coulson in 1997, and a copy of the marriage certificate was supplied by a then living descendant of the couple. The photo is a studio portrait. The imprint, ‘Boughtons, Ipswich’, identifies the photographer and likely location. Robert Pols’ Early Photographic Studios website surveyed trade directories and concludes that Boughton’s was a chain of photographers with studios that operated in several Norfolk and Suffolk towns, including two Ipswich premises, 24 Buttermarket and 25 Westgate Street. As Suffolk’s county town, Ipswich was the nearest sizable town to Hitcham, the birthplace of sisters Grace and Maud. In 1911, Maud worked as a general domestic servant in Alfred Gosselin’s household at 7 Broughton Rd, Ipswich. It is most likely that Grace and Charles had their photograph taken on a visit to Ipswich. Maud’s son, Raymond, inherited a postcard collection from her. Grace sent Maud postcards for her birthday on the 9 May regularly. Not all are dated or addressed, but it is possible to track the sister’s residences over time. In 1921, Grace’s address was 32 Bright Street, the same as given at her marriage. Church of England, St Marks church. Certified copy of an entry of Marriage. England, Northampton, Peterborough district. Issued 26 July 1919. Photocopy. citing Marriage Register, no 374. 1919/07/26. Peckett, Charles & Knock, Grace Constance Violet. Census, 1911. England, Suffolk, Ipswich, ED 22, image no. 885, household schedule no. 151, Gosselin, Alfred; Ancestry (ancestry.co.uk: accessed 41471); citing The National Archives RG 14/10847.